Considering that Steam now allows fully uncensored titles as is the case with this visual novel https://steamcommunity.com/games/432100 ... 1080289382 is there a chance for a Steam release of Katawa Shoujo? 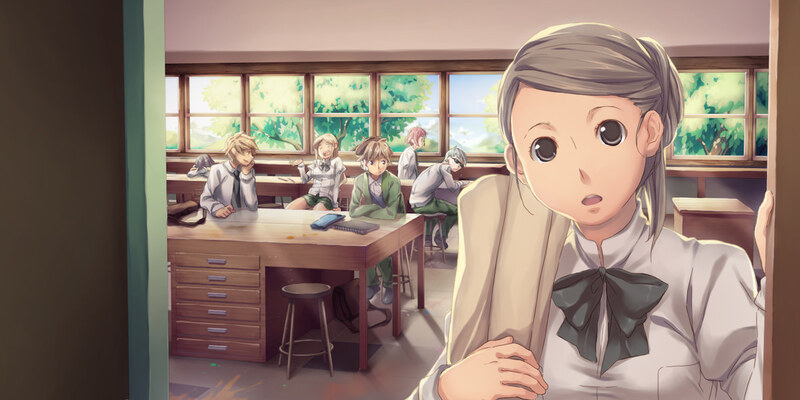 It's pretty much accepted "fanon" at this point that the blonde girl in the background of this classroom CG is Saki. But if you had to give a name to the girl at the door, what would it be? Thanks. The Shimmie lists her as "Chiharu". I didn't even know she was on the Shimmie. Thanks. Something that always stuck with me as a odd detail with Kenji was Hisao's mention that he (or his room) reeked of garlic. I don't know why but to this day I remember that particular detail. Now it might just be that he likes having garlic to his food but this is Kenji we're talking about here, nothing is quite as it seems with him. My question is, does Kenji believe in vampires? Or does he think the garlic will keep girls out of his room? Is it some cultural pun or joke? He also eats a lot of pizza and steals books from the library. Definitely some Italian influence there. what happend to mishimmie, it's been days unaccesible, did you decided to shut it down definitively or it is just going to have a prolonged maintenace? The server that was hosting it kicked us off for some reason. I think someone backed up all of the photos and some of the files. Since no-one else is volunteering I'm going to see if I can remember how to host a website and then move the files across there, but I haven't done that in years so you'll have to bare with me whilst I remember how to Internet. Have you got the image metadata (source, tags, comments, etc)? I was thinking of scraping the most recent versions of what I could from archive.org, and possibly making a local (open source) shimmie viewer/searcher if not a website myself (although a website is unlikely from me because I'd have to host it from home). I'm just wondering if I still need to scrape it myself or not to retrieve it. archive.org has ~39000 saved URLs, there's a pretty good chance at recovering all tags and much of the other info. Yesterday, I noticed that there came out a new page domain for shimmie, but it said that the website is still not uploaded. At approximately what time will it come out, or is the preparation taking long time to finish?